Our beautifully furnished suite is 10 years old and fully equipped. In The Plaza at Ocean Club West you have full access to the amenities at Ocean Club West Resort. This includes our attended beaches with lounges and umbrellas. Enjoy the large pool at Ocean Club West and dine at the beachfront Seaside Cafe with delicious, well priced breakfasts, lunches and dinners. Play on the two lighted tennis courts or work out at the fitness center and be pampered at the Spa. Your suite is within a 5 minute walk to excellent shopping and some of the finest restaurants on the island, such as the Caicos Cafe and 2 bakeries. Port of Call center has more restaurants, an ice cream store and a number of shops. The new full service IGA gourmet grocery store is here also. Upscale shopping at the Saltmills and Regent Grand as well as the casino are all within 1/2 mile. Grace Bay Beach Resort Area: We are in the heart of the Grace Bay Resort area. Rooms at adjacent resorts are priced well over $1,000 per night. Many of the finest restaurants are in the immediate area. The best shopping such as Regent Grand, Port of Call and The Saltmills are within a short walk, as is a modern full service grocery store. Several car rental agencies are nearby. Ocean Club West on Grace Bay Beach: Ocean Club West is one of the finest Grace Bay Beach Resorts. The Grace Bay Beach is attended and lounges and umbrellas are provided. The tropical landscaping is lush around the large free form swimming pool. The Seaside Cafe is located at the beachfront and serves breakfast, lunch and dinner. It also has a full service bar. There are lighted tennis courts and a fitness center. The Ocean Club West Plaza: This is the newest building at this Grace Bay Beachfront resort of Ocean Club West. Our suite is a modern condominium unit and is fully furnished and equipped. Most of the amenities of Ocean Club West are available to our guests. My wife, Bunny and I first visited Provo in 2003 and stayed at the original Ocean Club. We bought our unit there on that first trip. We since purchased 2 suites at the Ocean Club West Plaza. We have been renting on HomeAway for over 6 years. You will be located in the heart of the Grace Bay resort area and do not need to rent a car. All you need is within a short walk. You have use of the amenities of the Ocean Club West resort located on the world #1 rated Grace Bay Beach. Bathrooms are large and modern with enclosed showers. Ample counter space and storage. Towels provided. All amenities of the Ocean Club Resort. Includes tennis courts, large free form swimming pool, fitness center and attended beach with chairs, lounges, umbrellas. Walk to many of the best restaurants and shopping on the island. At Ocean Club West Resort. Seating and table outside our suite. Courts on site at Ocean Club West. Provo Golf Club, rated top 10 in the Caribbean. Additional charge applies. Discount availaable to our guests. The review says, Bunny and Jim (the owners) because the Home Away website was down when we were reserving, so, Bunny and Jim were kind enough to put it under their names. We so very much enjoyed our stay, condo had everything we needed. The island was truly a paradise. Thashena, their manager was such a help, sending us information before we arrived. The ocean was a 3 minute jaunt, as advertised. We have stayed at Ocean Club properties on Turks & Caicos several times, and it has always been an excellent experience for us. Locations are great, prices are reasonable compared to others, and a laid back style. Our stay at the Plaza building was no exception. While separated from the main resort, it is still only 80 yards away from the front desk area, 150 yards to the nearest resort rooms, 200 yards from the pool, and the beach is just beyond. Plaza is on the road to all the shops, stores, restaurants close by. Very convenient. The unit is large, clean, well equipped, full kitchen, everything works. No noise from the neighbors, and very minor traffic noise during daylight working hours. We always rent a car, and parking is right outside the door, also super convenient for bringing in groceries, supplies, and sightseeing. There is no daily maid service, but that's fine with us, one less interruption. Because the owners have a property manager, there is no wasted time on check-in and check-out. Walk in the door when you arrive, walk out when you leave. While not necessary at all, rent a car for at least a couple of days and explore the island. Lots of beaches, sights, restaurants, with plenty of interesting and kind people. Have never had any issues of any sort. Speeds are low and drivers are courteous. You get to drive on the left side of the road, not difficult, and can create your own adventure. The condo has all the basics (kitchen, pool, beach) covered, has access to all the facilities of Ocean Club West resort (pool, beach chairs, gym, etc) and is in an awesome location: between 5 star resorts, close to groceries (Graceway Gourmet and small alcohol/groceries across the street), restaurants/food gems (Caicos Bakery - awesome bread and pastries, Caicos Cafe, Cocovan, The Patty Place ice-cream), ocean front restaurants/bars (Solana on the property, Infinity Bar, The Deck and more) and close to great beaches (2 min walking through the resort to Grace Bay and a 5-10 min drive to beautiful and secluded Pelican, Leeward and Long Bay). Our family of 4 had a great time in Providenciales and we will be back. My wife and I have stayed at Ocean Club West before so knew about the beautiful grounds, staff, pool and amenities the place has to offer. This was our first trip to the island with our kids (5 1/2 and 3 1/2) and we opted to stay in the Plaza condos which is literally 50 yards at best from the drop off circle of the main lobby. This unit did not disappoint! The walk to the main pool/beach area is no more than 3-5 minutes. Get past not being right in the main complex quickly after you see difference in price and you get almost everything they do! Staff at OCW and the restaurant is great. Conch fritters, salad with shrimp and the sushi at Solane after 6 pm is a recommendation. Bring a soft cooler bag with you, go out and get your favorite wine or beer and get yourself beachfront for one of the best vantage points for paradise sunset every night. I look forward to coming again in the future. Easy living. Good food. Home vibe option. Best location ever. Residential feel. Clean. Friendly. 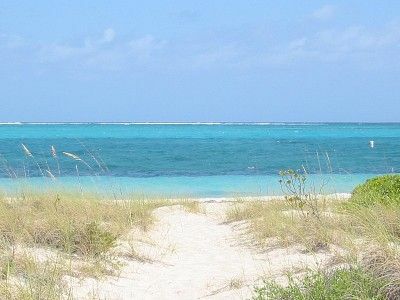 Grace Bay is a wonderful community. Thank you so much! You were WONDERFUL guests and we want you to come again!!! This was our third stay at Bunny and Jim’s condo. This trip we stayed for 10 days to soak every moment of sun and relaxation possible. The condo is well equipped and was so convenient for easy breakfasts and lunches. The gym is small but well equipped. It was easy to find open lounge chairs/umbrellas on the beach at any time of the day and the water continues to be the most beautiful I’ve ever experienced. We saw a starfish the size of a dinner plate one day just off shore and a smaller one a few days later. Dinners were all great, our favorites were Seven, Infiniti, and Kalooki’s; all within easy walking distance of the condo. All in all, another fantastic trip! We are located on Grace Bay Road, in the heart of the Resort area. We are at The Plaza at Ocean Club West and have access to Resort amenities and the Best Beach in the World. Rates quoted are for up to 4 guests. There is a $40 per night charge for each additional person (including infants and children), up to a maximum of 6 people. Arrangements must be made in advance. Monthly rates are for 28 nights and are based on availability and subject to prior approval. Rates spanning the seasons above will be prorated. Full use of all the amenities at Ocean Club West are included.